Confession: Sometimes I get more excited about hair than makeup. If I had more skill manipulating hair the direction of this blog might have been entirely different, but alas, another confession: I don't know how to style my hair at all. I can barely even handle a respectable braid. This kills me when I see girls with perfect beachy waves, elaborate updos, simple updos even. I just can't do anything but hope my hair looks pretty when I leave it down. So, I'm not an expert on hair, but I love it. I love good hair so much that having bad hair ruins my entire day. I mean, if you have bad skin at least you can throw some foundation over it, right? Anyway, a few readers have asked how I style my hair and the simple answer is I don't. I don't own a flat iron and my curling iron is relegated to an unknown back closet somewhere. The only thing I use for now is the Shu Uemura Muroto Volume Amplifying Shampoo and Conditioner. I have pin straight Asian hair, which wouldn't bother me as much if it weren't also so flat. These two bottles are basically fairy volumizing dust in a bottle. It contains Depsea water, an ingredient widely used in their skincare, which softens and nourishes the hair (my hair has never looked and felt this healthy) while delivering the promised volume. It also doesn't hurt that it smells absolutely amazing (the fragrance listed on the website is Aquarelle). 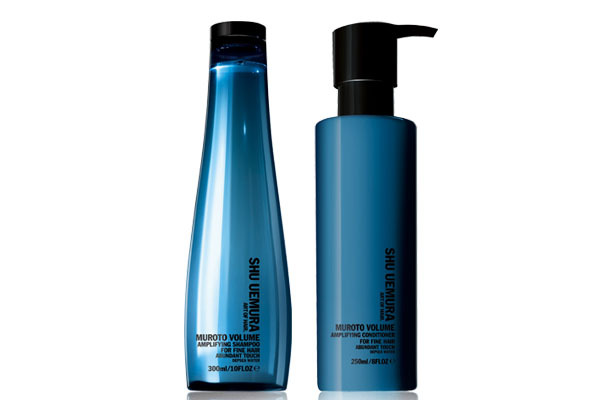 Shu Uemura Muroto Volume Amplifying Shampoo and Conditioner retails for $48 and $58 respectively. It is a shocking amount to spend on hair, but I don't buy any other product. With these I don't feel the need for hair oils or volumizing gels and mousses. They can be found at certain salons but for convenience I ordered them from shuuemuraartofhair-usa.com. Beware though, as I found out the hard way, once you start using this there is no way to go back. Is the shampoo SLS free? My scalp *hates* SLS :(. Anne JF- Shu has some of the best ones in the market, I hear! Ah, I wish dry shampoo worked on me too. All it seems to do is weigh my hair down. I'm pretty hopeless when it comes to hair, too. I wish I knew how to do one of those casual messy buns. :( My hair is naturally wavy, so when I don't have time to get a blowout at the salon I just wash it and let it air-dry overnight and hope for the best when I look into the mirror in the morning. Like Dani, I am anti-SLS. Recently BTiBeauty turned me on to Rahua. It does a very nice job of volumizing, and I swear my hair looks fuller and healthier every time I use it. So you don't seal your hair with any oils afterward? I'm pretty much addicted to Rodin by Recine. Leigh- ah casual messy buns </3 super jealous of your naturally wavy hair! OH. MY. GOD. I didn't even know they had haircare products! You are terrible for my wallet lady! I didn't know Shu Uemura makes hair products! Hey Xiao. I'm so glad to hear your thoughts on this. I have the same type of hair. Very fine, long, but mine is slightly wavy. Recently, after having my second child, I had a dramatic weight loss and now I'm actually losing hair! I was thinking of trying this shampoo, or the cleansing oil for hair. Have you tried that? I know Raeview uses it and she has pretty fine hair. It seems to give her lots of volume. Hmmm. Thanks for your thoughts! theres free shipping at shu uemura for a limited time for anyone who's interested in trying their products! usually shipping is pretty pricey..
time4beauty- aww why! you don't like their hair stuff? BGissm- oh no! (but congrats on your second child!) I haven't tried the cleansing oil so I'm afraid I can't give you my thoughts on it. But Rae's review does make me want to try it... let me know what you choose in the end! AZ- ooh thanks for the update! And I think if you sign up with them you can get two free samples. I haven't tried the other products because they don't really fit my hair concerns... The essence absolue is tdf though. Nicoleen- I can always bear to part with products if there's something better :) When this one runs out I'll look into it. Thanks! OMG. I so want a digital perm. I have Asian hair and lashes (well...in the sense that my hair is really fine and straight and that my lashes are pin-straight too :D)...and I think a digital perm could safe my life. I bet you can't do it in Denmark. If anyone knows a place in Denmark or anywhere in the EU, please let me know! All I ever use in my (long) hair is sls-free shampoo, conditioner from Klorane and a heat protectant spray from Tresemme. It's lovely, doesn't weigh your hair down and adds shine. But I don't style it. I've been considering buying a Babyliss wide barrel curling iron to give the front bits of my hair some movement, but a digital perm would be much more awesome and less time-consuming. I am the opposite of you! I have puffy slightly-frizzy-but-not-yet-wavy Asian hair that I have to waste 10 minutes straightening every single day. I sometimes wish I got the pin-straight hair so I can wake up in the morning and not worry too much, but I guess the grass is always greener on the other side! I'm with you though when it comes to not knowing how to style my hair. I can't even curl it without looking ridiculous! And it figures that my mom's super talented in this aspect and can't understand my inability to do anything but straighten, lol. i have the same problem with my hair. So while ordering the cleansing oil from shu, i also chose two samples which is the exact same thing for fine hair but instead of the conditioner i wanted to try the treatment. I love both! idk if you like to treat your hair once a month bc the treatment is wonderful. My hair has more volume and it gets less tangled. I love it!